RealMilk.com has been instrumental in educating people on the value of injesting raw milk. This link provides information on an ABC news story which freatured people in their quest to get this nourishing product. RealMilk.com lists places throughout the country to obtain milk the way God intended us to drink it! You may ask 'raw goat milk'? Why should I care about it. American's have been 'culturized & advertised' into associating milk with cows when in fact, goat milk is far more healthy for humans. In Maud, Texas goat milk is all we drink - it's God's complete food! 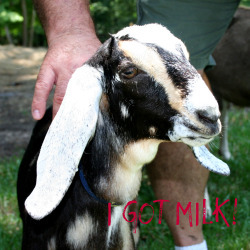 According to the Journal of American Medicine, "Goat's milk is the most complete food known." It contains vitamins, minerals, electrolytes, trace elements, enzymes, protein, and fatty acids that are utilized by your body with ease. In fact, your body can digest goat's milk in just 20 minutes. It takes 2-3 hours to digest cow's milk. 'You shall have enough goats' milk for your food, for the food of your household, and the nourishment of your maidservants' (Proverbs 27:27). Goat's milk does not suppress the immune system. Goat's milk alkalinizes the digestive system. It actually contains an alkaline ash, and it does not produce acid in the intestinal system. Goat's milk helps to increase the pH of the blood stream because it is the dairy product highest in the amino acid L-glutamine. L-glutamine is an alkalinizing amino acid, often recommended by nutritionists. Pg. 148 - "The Makers Diet"
Goat's milk does not product mucus; it does not stimulate a defense response from the human immune system. Goat's milk is a rich source of the trace mineral selenium, a necessary nutrient, however, for its immune modulation and antioxidant properties. Pg 149 "The Maker's Diet"
Goat's milk also contains 7% less lactose than cow milk. Additionally, most lactose intolerant people have found that they can tolerate goat's milk and goat milk products. Goat's milk has long been used and recommended as an aid in the treatment of ulcers due to its more effective acid buffering capacity. Children on goat's milk have been observed to sleep through the night and remain more satisfied between meals. Natural milk contains many bioactive components, which serve to retard the growth of harmful organisms, and to protect the health of the person consuming them. Goat's milk contains the same important bioactive components as mother's milk. The goat community cannot say thank you enough for all the hard and diligent work that Molly has provided for us. Her information on goats well researched and complete. This is her information on raw milk and it's benefits.